Food is not a fake friend to me. I know what food expects and I can provide that. Hands to grab it and a mouth to chew it. Simple demands that I can provide. Food, my companion is always in my cupboard or a short drive away at the grocery store. So many varieties. We have the standards; sweet, salty, sour. There is almost nothing I like better than perusing a high-end grocery store. It’s not that I would even eat half the stuff in there, my palate is not that adventurous. But I love to look at the roasted and marinated meats (I’m a vegetarian), the prepared pizzas on homemade dough, salads of every color and texture and the sweet swirl of breads, pies and cookies. Lastly, sound the trumpets, are the decorated cakes. I would marry a decorated cake. Maybe a wouldn’t actually marry a cake, but I do have an eternal cake crush. 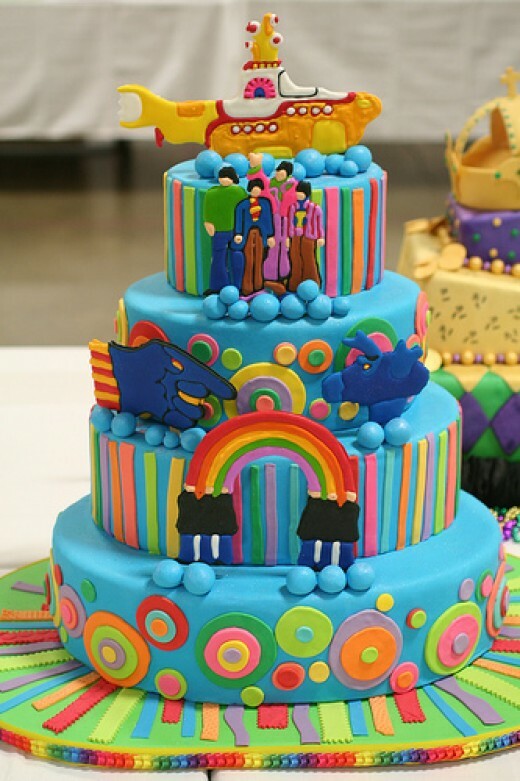 Whoever concocted the cake above loved the Beatles one can assume. It was probably the cake doctors on that TV show. Wizards without a doubt. Because I am talking about food I am also talking about weight, cousins those two. And yes I have been walking. Wake up at 5 am and am out by 5:15 am for a 45 minute heated jaunt. I am ashamed to say I missed yesterday which makes it 4 days I’ve missed out of 11. Not great. However, I just glommed onto a factoid: If I walk the next 3 days I’ll been successful 11 out of 14 and that just about hits my goal.